The Washington establishment loves talking about the “distribution” of income and taxes. The CBO has issued a new report on the topic that will no doubt keep the discussion rolling on. That said, the CBO report has some interesting statistics to consider. Most important are calculations of average federal tax rates, which are total federal taxes paid as a share of income. The chart shows average tax rates by quintiles, which each contain one fifth of U.S. households grouped by income level. The households at the top are hit with the largest burdens by far. Elsewhere, I’ve discussed who some of these high-earning households are and the damage done by nailing them with such high taxes. (For example, see here and here). The annual Wiretap Report released by the Administrative Office of the U.S. Courts only captures the tiny tip of our vast electronic surveillance iceberg, but it does at least provide a lot of useful data about one type of government spying: Eavesdropping on phone calls in the course of criminal investigations. And so each year, the handful of journalists who keep an eye on this sort of thing dutifully report the bottom line number, and how much of an increase (usually) or decrease (very occasionally) it represents over the previous year’s number. But there’s an important qualifier: The number that makes it into the headlines is consistently 600-700 wiretap orders short, compared with the amended numbers quietly released years later. And the discrepancy between the headline number and the final estimate has been getting worse over time. In 2001 and 2002, about 12 percent of the wiretap orders ultimately included in the official tally for those years were reported to the Administrative Office after their filing deadline—and therefore not included in the Wiretap Report for that year, or any of the press coverage surrounding it. By 2006 and 2007, fully 25 percent of wiretap authorizations weren’t counted in the report for that year. By 2008, it was more than 28 percent. While the headlines reported a 14 percent decline in wiretap orders for that year—to “only” 1,891—the current amended tally stands at 2,632. That’s a more modest 10 percent decline over the previous year’s amended number—and in fact it’s quite probably less than that, because future reports are likely to keep increasing the tally for those years, with the biggest amendments typically made to more recent years, further closing the gap. The percentage of late-reported wiretap orders for 2009 and 2010 drops a bit—but almost certainly that’s because there are plenty that still haven’t been reported. The summary of supplemental reports from this year’s Wiretap Report, covering 2011, added dozens of late reports each year from 2006 and 2007; hundreds per year for 2008–2010. Extrapolating that trend forward, we can pretty confidently predict that this year’s estimate of 2,732 wiretap orders is a significant undercount, that the real figure is closer to 3,300 or 3,400, and that we won’t actually have a realistic estimate for another three or four years. All that, of course, assumes that the AOUSC does eventually get a reasonably complete accounting of wiretap orders—though when we’re seeing hundreds of late reports coming in two and three years after the statutory filing deadline, it doesn’t seem entirely unreasonable to suppose that some slip through the cracks entirely. In any event, this is unfortunate for a couple reasons. As I suggest above, what gets prominently reported is almost always just the prior year’s number in the most recent report—which means the further off that number is from the ultimate estimate, the more distorted the picture the public gets. I informally queried a few journalists who write in this area, and found that even the very knowledgeable ones were unaware that the numbers were typically revised up by such a large number. Moreover, the deep-dive analysis in each year’s report is, unsurprisingly, focused on the previous year’s activity based on whatever data they have at the time. If they’re missing 28 percent of the data points, that analysis is less likely to represent reality faithfully. None of this is the fault of the AOUSC—they’ve got to work with whatever hundreds of judges and prosecutors manage to get them by their deadline—but it’s a big enough gap in the data that it deserves to be flagged in the press coverage of each year’s numbers. In yesterday’s New York Times, Thomas Ricks penned an op-ed calling for the draft to be reinstituted. Ricks offers that under his plan for military conscription, libertarians who object could opt out provided they don’t partake of Uncle Sam’s other goodies such as federally subsidized mortgages, Medicare, and college loans. As a libertarian who objects to a draft, but who also received an NROTC scholarship in exchange for an active-duty commission, I think that Ricks is offering conscientious objectors a raw deal. Those opting out, of course, could not refuse to pay the taxes that are used to fund government programs. That would be great for the government—compel people to pay for services that they will never use—but it is profoundly unfair, especially to young adults. Mr. Ricks’s plan will certainly cost more money than our current all-volunteer force, especially in the near term. For example, we can expect tuition to skyrocket as soon as college administrators realize that the taxpayers are on the hook to pay for these new conscripts’ secondary education. The long-term savings that Ricks anticipates from changes to the military retirement are likely to prove equally elusive; past attempts to rein in costs for military retirees, including changes to eligibility rules, have repeatedly failed. There are sensible ideas for fixing the problem, but the politics are still really tough. A draft is unlikely to save us money, but it will certainly abridge young people’s freedom. It is unfair to older adults, too, who would see their taxes rise. To add insult to injury, many older adults would see their tax dollars go to pay low-wage workers who would then be competing with them for jobs. Mr. Ricks thinks it’s outrageous that a 50-year old janitor earns $106,000 a year, plus overtime; the janitor would disagree. Others who would suddenly be forced to compete with a taxpayer-funded horde of 18-year olds include day care providers, nurses, and construction workers. Libertarians want minimal government, as Mr. Ricks claims, but his plan would dramatically expand government power, abridge individual liberty, and distort the labor market. Despite his claims that this will be beneficial to the economy, economists long ago concluded that the all-volunteer force is superior to conscription. Conscription is a superficially great deal for the government, but a net loss for the taxpayer and draftee in hidden costs, and lost freedom. I am sympathetic to Mr. Ricks’s desire to avoid rushing headlong into other foolish wars. It is too easy for the United States to wage war and send resources—drones, special operations forces—to low-level conflicts. Congress has abdicated its responsibility to declare war and deficit spending kicks the monetary costs down the road. But the draft is not the answer. Instead, let’s begin our search for a solution by forcing the advocates for such wars to a higher standard of proof, and holding them accountable when their rosy predictions of quick success prove erroneous. Last month, I exposed some major errors that Paul Krugman committed when he criticized Estonia for restraining the burden of government spending. 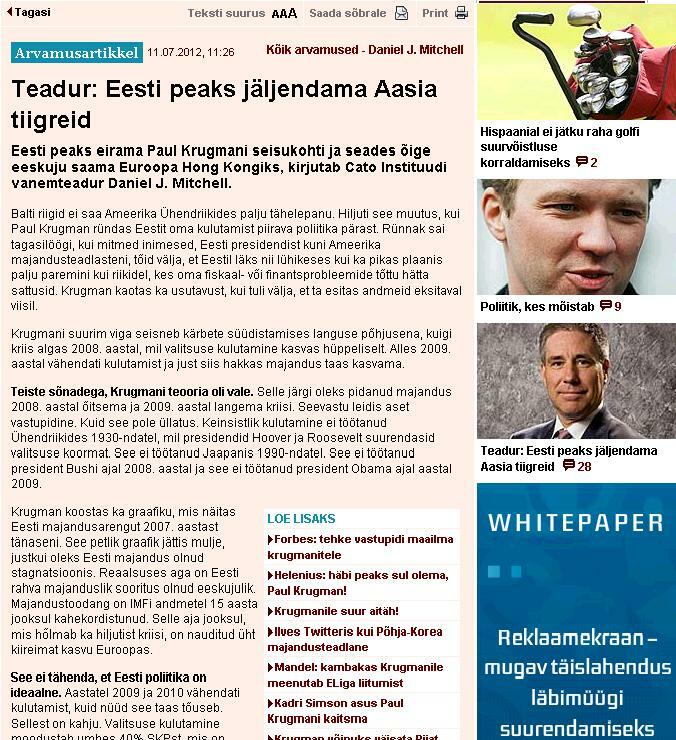 My analysis will be helpful since I am now in Estonia for a speech about economic reform, and I wrote a column that was published today by the nation’s main business newspaper. But just in case you’re one of the few people in the world who isn’t fluent in the local language, the Mises Institute Estonia was kind enough to post an English version. Here are some of the key points I made. I started by explaining one of Krugman’s main blunders. Krugman’s biggest mistake is that he claimed that spending cuts caused the downturn, even though the recession began in 2008 when government spending was rapidly expanding. It wasn’t until 2009 that the burden of government spending was reduced, and that was when the economy began to grow again. In other words, Krugman’s Keynesian theory was completely wrong. The economy should have boomed in 2008 and suffered a recession beginning in 2009. Instead, the opposite has happened. I then pointed out that Estonia’s long-run performance has been admirable. …the nation’s long-run economic performance is quite exemplary. Economic output has doubled in just 15 years according to the International Monetary Fund. Over that entire period – including the recent downturn, it has enjoyed one of the fastest growth rates in Europe. But I’m not a mindless cheerleader (though I might become one if any of the local women gave me the time of day), so I took the opportunity to identify areas where public policy needs improvement. This doesn’t mean Estonia’s policy is perfect. Spending was reduced in 2009 and 2010, but now it is climbing again. This is unfortunate. Government spending consumes about 40 percent of GDP, which is a significant burden on the private sector. Being a thoughtful guy, I then made suggestions for pro-growth changes. Estonia should copy the Asian Tiger economies of Singapore and Hong Kong. These jurisdictions have maintained very high growth for decades in part because the burden of the public sector is only about 20 percent of GDP. …Estonia already has a flat tax, which is very important for competitiveness. The key goal should be to impose a spending cap, perhaps similar to Switzerland’s very successful “debt brake.” Under the Swiss system, government spending is not allowed to grow faster than population plus inflation. And since nominal GDP usually expands at a faster rate, this means that the relative burden of government spending shrinks over time. By slowly but surely reducing the amount of GDP diverted to fund government, this would enable policymakers to deal with the one area where Estonia’s tax system is very unfriendly. Social insurance taxes equal about one-fourth of the cost of hiring a worker, thus discouraging job creation and boosting the shadow economy. And I elaborated on why reform of social insurance is not just a good idea, but should be viewed as an absolute necessity. Reducing the heavy burden of social insurance taxes should be part of a big reform to modernize programs for healthcare and the elderly. A major long-term challenge for Estonia is that the population is expected to shrink. The World Bank and the United Nations both show that fertility rates are well below the “replacement rate,” meaning that there will be fewer workers in the future. That’s a very compelling reason why it is important to expand personal retirement accounts and allow the “pre-funding” of healthcare. It’s a simple matter of demographic reality. In other words, Estonia doesn’t have a choice. If they don’t reform their entitlement programs, the burden of government spending will rise dramatically, which would mean a higher tax burden and/or substantial government debt. We also need entitlement reform in the United States. Our demographics aren’t as bad as Estonia’s, but we all know - as I explained in my post about Cyprus - that bad things happen sooner or later if government spending grows faster than the economy’s productive sector. On Monday, I puzzled over a strange data point to come out of a series of newly-released reports from cell phone carriers revealing, for the first time, the incredible quantity of government surveillance of Americans through their mobile devices: One company, Sprint, had reported dealing with a staggering 52,029 “court orders for wiretaps” over a five year period, which was more than double the officially reported number of criminal and national security wiretaps over the same period. I think I’ve got a benign explanation for that puzzle—briefly, it all depends on how you’re counting—but one that also underscores how impossible it is to get a meaningful grasp on the real scope of government surveillance without some kind of formal, standardized reporting mechanism. Sprint was counting the targets (i.e. phone numbers) and the work effort involved for Sprint. For example, Sprint counted each target on an order, and each order often has multiple target numbers. In addition, Sprint operates several technologies and platforms which increases the work effort associated with provisioning a wiretap. For example, if a wiretap order requests interception of both the voice calls and the direct connect calls, that is essentially the provisioning of two separate wiretaps and so Sprint counts them separately. Finally, Sprint also counts separately any extensions of the initial order (i.e. an additional request regarding the same phone numbers.) We believe these accounting differences are the reason Sprints numbers appear to be greater than other carriers. That makes a good deal of sense. The annual wiretap report tallies up the number of approved wiretap applications, but since criminal wiretaps are overwhelmingly used in large narcotics investigations, you’d expect a single application to cover many individuals, and probably multiple phone lines or accounts for each individual. The numbers bear out that intuition: The average approved application ran for 42 days and picked up 3,716 communications involving 113 different people—or 88 communications per day. Either those are some very chatty drug dealers, or the average wiretap order covers several individuals and phone lines. Given that Sprint is the third largest carrier, but leads the pack when it comes to prepaid phones—which cautious dealers sometimes cycle through in an effort to stymie surveillance—you might expect them to have an especially high number of different lines covered under the aegis of a single authorization. The trouble is, if you look at all the carrier responses, it’s clear that they’re not reporting “requests” in any kind of standardized way. Verizon and AT&T just give an aggregate number of “requests” for last year, with no indication of how they’re counting requests. Is a single piece of paper targeting voice, data, and text message records for each of a dozen individuals one request, a dozen requests, or 36 requests? Or maybe 24 because two of the three are lumped together? Sprint gives a five-year total broken down into wiretaps, pen registers, and location requests—though doesn’t give a breakdown of the specific authorities implicated, and makes no separate mention of other kinds of records orders, which certainly exist. Sprint also gives a count of subpoenas, but suggests that here it’s actually just counting pieces of paper, not individuals, with multiple accounts typically encompassed by each subpoena. The smaller U.S. Cellular breaks its information down into nine different types of authorities, but doesn’t specify the type of information—such as location tracking—sought in each order. The estimate of “1.3 million requests” each year is therefore a bit of a Frankenstein statistic, because it seems obvious there’s no consistent way the different carriers are counting requests—and even within a single carrier, the method seems to vary by category of information. If everyone counted the way the wiretap report does—”applications approved” without regard to the number of persons or facilities targeted—odds are you’d get a substantially smaller number. If you count count targets and facilities, you probably get a much larger one—though even that may understate the situation. For example, Sprint notes that the Justice Department believes it can use tracking authority not only to geolocate the target for whom they have an order, but also any “associates” those people communicate with, at least during the course of the call—which you could probably make a case for counting as a separate “request” for information about another individual’s account. What we pretty clearly need is some kind of standardized, regular reporting of the full gamut of electronic surveillance government does, so that Congress and the public can make informed decisions about how well the system is working—and spot new technologies that might work to circumvent existing safeguards. The alternative is what we’ve seen happen with location tracking—a tool that has become incredibly pervasive behind our backs. Sprint alone reports nearly 200,000 location orders over the past five years. Extrapolate that out to the other carriers—and factor in the concentration of requests in more recent years, since everyone seems to report an upward trend—and we’re likely talking about at least 100,000 annually. Congress is only just now starting to consider clear, uniform standards for this intrusive surveillance, in part because nobody had any real sense of the incredible rate at which the practice had increased and spreed. Legislators like to talk about striking a reasonable balance between civil liberties and the needs of intelligence or law enforcement—but even accepting that problematic metaphor, how can they possibly strike a balance when they can’t even see the scales? This morning Republican presidential candidate Mitt Romney spoke to the NAACP – not a group traditionally friendly to GOP pols – and made school choice a focus of his address. It was a politically smart message to deliver (though, importantly, federal vouchers outside of DC would be unconstitutional). School choice is very popular with African-Americans, who are often saddled with the worst public schools. Indeed, according to a 2011 Education Next poll, 50 percent or more of African-Americans either “completely” or “somewhat” favor vouchers for students to attend private schools, versus just 23 percent or fewer who oppose the idea. (The results depend a bit on question wording). When presented with tax credits for individual and corporate donations for private school scholarships, “somewhat” or “complete” support hits 57 percent. It’s a not-so-well-kept secret that the strongest opposition to school choice comes not from the people it would most directly benefit, but the wealthier “soccer mom” demographic that doesn’t seem to realize that though they may like their public schools, not everyone can afford to choose a school by buying a house. Of course that’s an incredibly inefficient way for anyone to choose a school, but it goes from an efficiency afterthought to a life-altering problem when you can’t get your child into a place that is safe and able to maximize his or her potential. Many Americans don’t grasp that. Most African-Americans do. A year ago this coming Sunday, the U.S. Court of Appeals for the D.C. Circuit ordered the Transportation Security Administration to do a notice-and-comment rulemaking on its use of Advanced Imaging Technology (aka “body-scanners” or “strip-search machines”) for primary screening at airports. (The alternative for those who refuse such treatment: a prison-style pat-down.) It was a very important ruling, for reasons I discussed in a post back then. The TSA was supposed to publish its policy in the Federal Register, take comments from the public, and issue a final rule that responds to public input. So far, it hasn’t done any of those things. The reason for the delay, stated in a filing with the court last year, was the complexity and expense of doing a rulemaking in this area. But CEI’s Ryan Radia, at work on a legal brief in the case, notes that the TSA has devoted substantial resources to the PreCheck program during this time, rolling it out to additional airports. How can an agency pour resources into its latest greatest project yet claim poverty when it comes to complying with the law? Defying the court, the TSA has not satisfied public concerns about privacy, about costs and delays, security weaknesses, and the potential health effects of these machines. If the government is going to “body-scan” Americans at U.S. airports, President Obama should force the TSA to begin the public process the court ordered. That’s not a huge request. Getting 25,000 signatures requires the administration to supply a response, according to the White House’s petition rules. The response we want is legal compliance. The public deserves to know where the administration stands on freedom to travel, and the rule of law. While TSA agents bark orders at American travelers, should the agency itself be allowed to flout one of the highest courts in the land? If the petition gets enough signatures, we’ll find out. Signing the petition requires an email for confirmation, but it does not sign you up for any mailing list unless you volunteer for that. If you’re quite concerned about sharing an email, you can create a throwaway email on AOL or Yahoo! and use it once. Please pass the word about the petition. If it gets to 25,000 people, the Obama administration will owe the public a response. I’ll report on it, and whether or not it’s satisfactory, right here.